Too often, couple and family therapists only focus on stopping arguments and teaching clients to fight fair, which doesn't lead to improved outcomes or deep healing. For the first time, we can offer clients secure and satisfying connections by exploring and systematically targeting key elements of the complex dramas that occur within relationships thanks to Emotionally Focused Couple Therapy (EFT) — the only model of couple therapy that has been tested and shown to create lasting change in over 20 empirical studies. Let me show you how to help the couples you work with create more secure lasting bonds with the proven tools, strategies and interventions featured in this mastery-level certificate course. Earn up to 16.75 CE Hours — included in the price! Earn your Certificate in Emotionally Focused Couple Therapy (EFT) — the only model of couple therapy that has been shown to create lasting change in over 20 empirical studies. 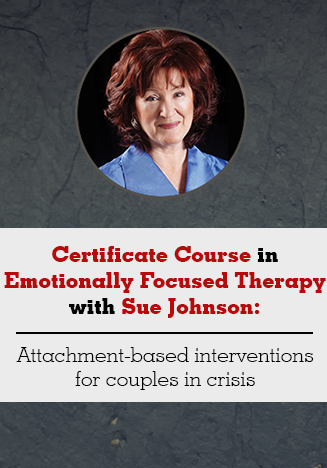 In this comprehensive 6-week certificate course, professor, researcher, clinical psychologist, and leading developer of EFT, Dr. Sue Johnson will share with you the science and application of Emotionally Focused Couple Therapy (EFT). Through engaging case studies, in-session videos, and masterfully presented lectures, Dr. Johnson will show you step by step how to apply the most effective, empirically validated EFT interventions to help the couples in your practice grow within their relationships. Enroll today and you'll get these THREE FREE BONUSES (A $219.97 value)! In this bonus session, you'll discover how to work more experientially and effectively with couples through two case presentations featuring real in-sessions demonstrations. You'll learn how to shape the safety that allows partners to risk and reach for one another, how to work with emotions in ways that shape emotional balance and mutual responsiveness, and how to shape bonding moments that transform love relationships. Dr. Sue Johnson’s energetic and vibrant personality shines in this bonus interview conducted by Linda Curran, BCPC, LPC, CACD, CCDPD, where they explore about Sue's most recent, revolutionary Emotionally Focused Therapy (EFT) study, Soothing the Threatened Brain. Register today and access an exclusive Q&A recording where Dr. Sue Johnson shares additional insight into working with couples. Susan Johnson, Ed.D., is the best-selling author, clinical psychologist, distinguished research professor, dynamic speaker, and recognized innovator who has changed the field of couple therapy. She is director of the International Center for Excellence in Emotionally Focused Therapy and distinguished research professor at Alliant University in San Diego, California, as well as professor of clinical psychology at the University of Ottawa, Canada. She trains counselors in EFT worldwide and is recognized as one of the most prominent researchers and presenters in the couple therapy field. Speaker Disclosures: Financial: Susan Johnson receives compensation as a tenured professor for the University of Ottawa. She receives royalties as an author for Little Brown, ICEEFT, Brunner Routledge, and Guilford Press. Dr. Johnson receives a speaking honorarium from PESI, Inc. Non-financial: Susan Johnson has no relevant non-financial relationship to disclose. Watch your email for your order confirmation, and get instant access to all 6 weeks of comprehensive training plus the FREE Bonus materials — all designed to help you effectively integrate proven treatment strategies into your practice. Review all the course materials at your own pace and at your convenience! Click here for course objectives and outline. Instantly collaborate with other professionals on the course materials through interactive message boards. You'll be part of a community of hundreds of practitioners all focused on mastering Emotionally Focused Couples Therapy, providing valuable opportunities to share insight and experiences and to build your professional network. Complete your online CE tests and earn up to 16.75 CE Hours! Click here for total course CE Credit.